Calvin Brasel fabricated his first removable insulation cover in 1986 and has spent his career perfecting his methods, learning new technology, and servicing customers. As the General Manager at Fit Tight Covers (www.fittightcovers.com) since 2011, Calvin leads CAD designers, Field Service Reps, and more than 25 fabricators to design and fabricate custom removable insulation covers for industrial and commercial sites throughout the United States. He can be reached at cbrasel@fittightcovers.com. Blankets, covers, pads, wraps, even diapers—all these words describe a fully encapsulated insulation system that can be applied, removed, and then applied again without special tools or skills. Removable insulation systems are commonly used on piping components that need to be accessed regularly for maintenance, calibration, or inspection, but still require insulation for personnel protection and to prevent unnecessary energy loss or to protect against outside elements. This article provides a comparison of the different types of covers on the market and analysis of the most appropriate use based on environment, temperature, and application. As mentioned earlier, there are many different words to describe removable insulation systems. 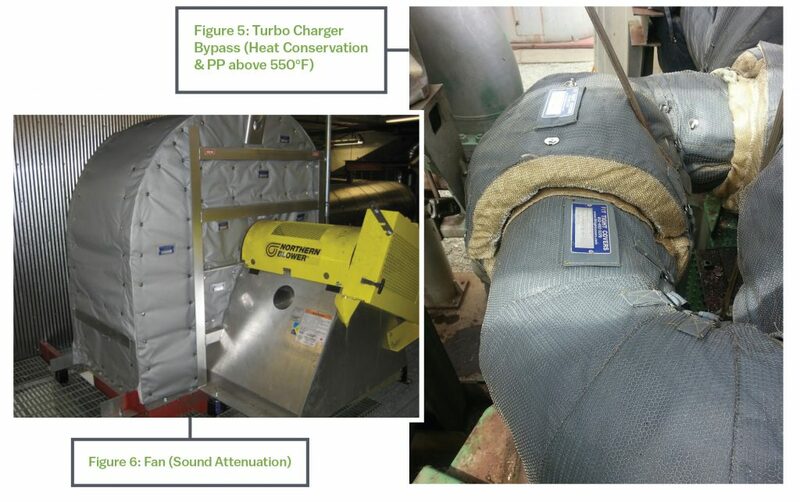 This article will consistently refer to these systems as “insulation covers” or just “covers.” A photo diagram and definitions of several other terms used throughout this article are shown in Figure 1 below. • The jacket is the outermost layer of fabric. • The inner layer of fabric closest to the item being covered is the liner. • The material sandwiched between the jacket and liner fabrics, which provides the R-value for the cover, is referred to as insulation. • The means of attaching the removable insulation cover, such as Velcro belts and buckles, or lace hooks and wire, is referred to as the securement. • Drawstrings include rope, cord, and string used to cinch down weather flaps on terminal ends. Another important distinction is the manner in which the cover is designed and fabricated. Are the covers sewn or stapled? If sewn, are they pinch style, flat and gusseted, or shaped and gusseted? Understanding the difference in these styles is critical to making a cost-effective decision on what cover will fit the needs of the mechanical system or equipment in the long-term. Depending on budget and application, there is a demand and market for all of these different types, but it is in the customer’s interest to understand all the options. First, “sewn or stapled” refers to how the jacket, liner, and insulation materials are brought together by the fabricator. The jacket, liner, and insulation of a more expensive cover will almost always be sewn together on an industrial sewing machine. Compare this to the less expensive “stapled” cover in which the materials are fastened together by metal connectors, staples, or hog rings. Sewing a cover requires specialized equipment and specialized training, along with industrial-grade thread, all of which result in a more expensive cover. However, sewing the cover allows for more intricate design and a better fit, which lead to greater energy savings and durability. Plus, the sewn seams resist weather penetration much more than a hog ring or stapled seam. The stapled or hog-ring covers are typically a flat design. “Flat design” means that the cover is designed and fabricated flat, like a big, thick blanket, and then simply wrapped around the piping system or equipment. These simple covers require minimal design time and significantly less fabrication time than a more intricate, shaped cover. Due to the simple design, these covers are usually the least expensive option and often work well for wrapping stretches of pipe. However, the design is not conducive to insulating a more complicated system. By the nature of their flat design, external conditions will reach the insulated component at any point in which air gaps exist between the component and the cover. Similar to the flat stapled covers are the flat and gusseted covers that are sewn rather than stapled. The jacket and liner are connected by insulation gussets, providing full insulation thickness throughout. The design is basically a large flat pad that is forcibly wrapped around the items needing insulation. Such design can be appropriate for simple systems, but for more complicated systems, these flat pads can result in the same issues as the stapled flat covers. 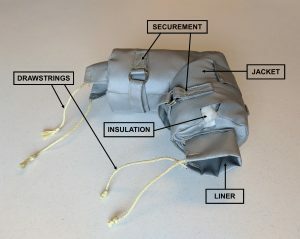 A second type of sewn cover is one in which the jacket, liner, and insulation are sewn through in one pass, pinching the insulation together with the jacket and liner, resulting in the name “pinch style.” Although quicker to produce and therefore less expensive, such a design severely impacts the effectiveness of the insulation at the sewing points. The final type of sewn cover is one that is shaped, gusseted, and made to order. 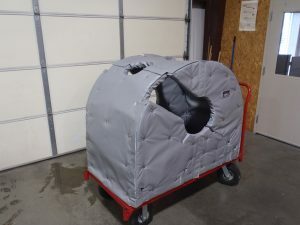 This custom cover connects the jacket and liner by shaped insulation gussets, providing full insulation thickness throughout the cover. Importantly, the cover is designed based upon the actual shape of the system or object needing insulation. In other words, even uninstalled, the cover is in the shape of the object it will insulate (see Figure 2 below). Such a design greatly reduces the air gaps, which in turn increases energy efficiency and impedes external conditions. A custom shaped and gusseted cover can accommodate interferences and penetrations while maintaining the tight fit. The actual materials used are critical to the effectiveness of the cover. There are many different options for the jacket, liner, insulation, and securement, and the correct specification always depends on the application and environment. For example, the cover specification for a system needing freeze protection is going to be very different from the spec for a cover meant only for sound attenuation. When determining the specification for a cover designed for freeze protection, the designer should consider the ambient temperature, the temperature of the system, electrical tracing options, and the environmental humidity levels. These factors will greatly impact the decision on which materials to use. 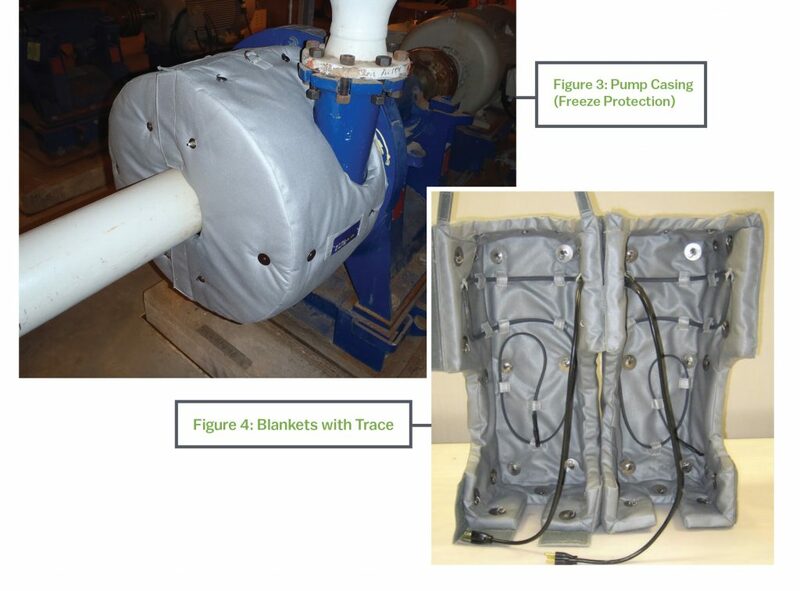 Such a cover intended for freeze protection will work best when coupled with proper electrical trace systems and designed to fit tightly to the component requiring protection. The success of the heat trace system depends on a properly fitting cover. If external conditions reach the insulated component, the component will freeze and fail (see Figures 3 and 4). For covers meant for heat conservation and personnel protection, the temperature of the piping system is the most important consideration. Materials used for these covers must be capable of direct contact with high temperatures for a long period of time, and the higher the temperature, the greater the thickness of the cover. These high-temperature mechanical systems usually include many interferences and are often in tight quarters, which can greatly impact the cover design. Such challenges are the specialty of the custom-fit cover designers, because they can design the cover to incorporate every interference and tight fit (see Figure 5). 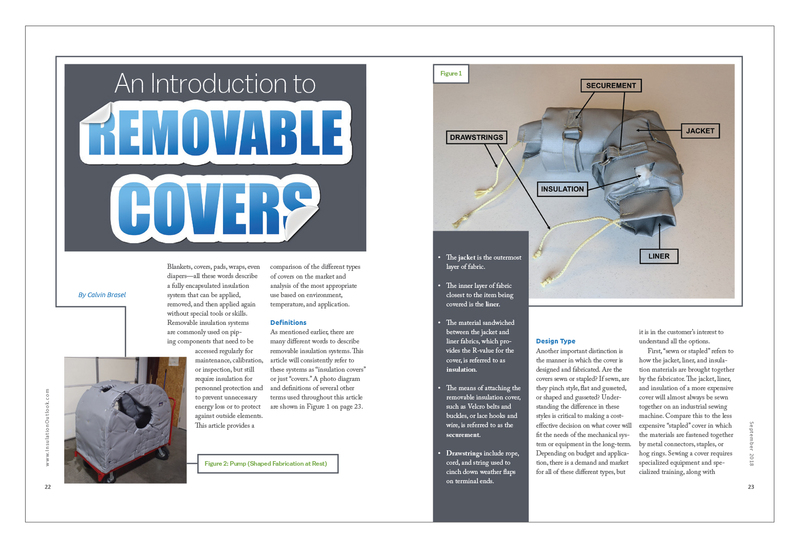 Another common use for removable covers is sound attenuation. Of course, environmental factors must be considered. Most important for sound attenuation is the ability for the cover to be applied directly to the equipment or valves that are the actual source of the noise. Such covers are most effective when the ambient noise levels are low. If the ambient noise level is high, limiting the noise produced by one piece of equipment is not going to lead to much improvement (see Figure 6). The last bit of information needed before ordering removable insulation covers is to understand the ordering and design process. The simple, flat covers can usually be produced without much input from the customer. Such covers are often sitting in inventory, and the fabricator can ship them where they need to go. By the nature of their design, custom-fit covers (the sewn, shaped, and gusseted covers) are produced one by one and not waiting in inventory. The fabricator makes each cover exactly according to the customer’s specifications and the system’s design needs, so a 2–4 week production lead time is customary. Depending on design time and market demand, that lead time can extend much longer. System dimensions, environmental factors, and temperatures will be required by the fabricator to design a cover that will serve its purpose. This information can be provided by the customer, or the customer can usually pay for the fabricator to send a field service representative to the facility. Such analysis will result in a 3D model, pictures, and/or drawings of the system, which is then used by the fabrication team to design and sew the custom-fit cover. Hopefully, a better understanding of the different types of removable covers available on the market will allow facility managers, engineers, and contractors the ability to more effectively use limited resources and budget. All covers are not created equal. The end user will be best served by evaluating the environment, application, and their long-term needs. This article was published in the September 2018 issue of Insulation Outlook magazine. Copyright © 2018 National Insulation Association. All rights reserved. The contents of this website and Insulation Outlook magazine may not be reproduced in any means, in whole or in part, without the prior written permission of the publisher and NIA. Any unauthorized duplication is strictly prohibited and would violate NIA’s copyright and may violate other copyright agreements that NIA has with authors and partners. Contact publisher@insulation.org to reprint or reproduce this content.